Torquay manager Kevin Nicholson wants midfielder Sam Chaney to be inspired by the success of Eunan O'Kane. O'Kane, 25, is now playing in the Premier League with AFC Bournemouth having begun his career at Plainmoor. 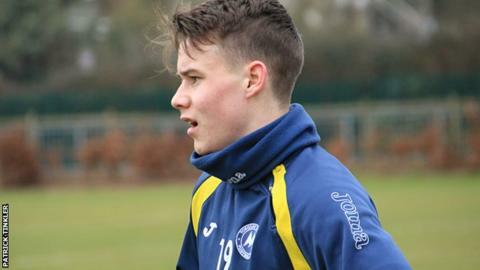 Chaney, 20, has started the last three games for Torquay having come up through the club's academy ranks. "Success for Sam Chaney now is to start running games, start getting on the ball like Eunan O'Kane, who we keep comparing him to," said Nicholson. Chaney had never started a game for the Gulls until the 1-0 loss to Eastleigh on Easter Monday, but has kept his place in the side for the subsequent two games, both of which the Gulls have won. "I didn't realise he hadn't started a game, I genuinely thought he had," Nicholson, who played alongside Chaney when he was in his first spell at the club which ended almost two years ago, told BBC Sport. "So when I gave him his first start the other week it was because he fully deserved it in terms of how he's been in training, how hard he'd worked, his attitude and the kind of team-mate that he is." And Nicholson says Chaney's transformation from a slight teenager to selectable professional midfielder has impressed him. "When I came in he was one that I knew a lot about because he was here when I was here," he said. "Physically he's come on to be almost unrecognisable from where he was three years ago. "He was a late developer but, if you see him now, he's put the work in at the gym, he's lived right and he's made sure that he's given himself every chance. "He knocks on my door more than most players to tell me that he's ready."